Follow in the footsteps of the British Salmon Lords when in Flaam. Or just experience Norwegian nature at its best. Flaam is a small village that counts some 380 inhabitants. It is a part of the municipality of Aurland, a region that roughly 1,700 Norwegians call home. You could say that Aurland is a rather typical example of a Norwegian rural municipality: In this country of mountains and fjords, it sometimes only takes a couple of hundred inhabitants to form a municipality (although most of them are much more populous than that). Despite its smallness, Flaam continues to be a living destination year-round – also during winter, when tourists are few. Compared to larger towns and cities, Flaam might lack entertainment, shows and other distractions. Flaam residents, however, have other advantages. How about spectacular views of steep mountainsides, deep blue-green fjords, easy access to hiking, and a spectacular flora and fauna? These are, of course, the very same factors that each year attract a large number of visitors – often arriving on cruise ships. Tourism started here in the early 19th century, when both Norwegians and foreign visitors started to travel in the region. A specific group of travelers were the British so-called salmon lords, who started to go to Norway to fish for salmon in the rivers. And so the Brits brought fly-fishing to this Scandinavian country, as they headed east to experience the untamed Norway with its many rivers. The Flåm River has been a favorite among anglers ever since. There are also many other alternatives for a good catch in the surrounding area. Flåm is situated on an arm of Sognefjorden, which, at 127 miles (204 kilometers) in length is one of the longest fjords in the world. 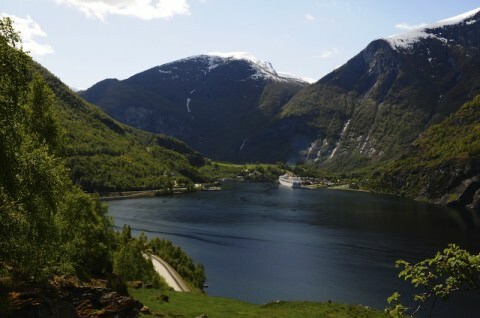 At its deepest, the fjord is some 4,290 feet (1,308 meters) deep. The Nærøyfjord, a fjord arm situated close to Flaam, is considered the most spectacular part of the Sognefjord. The Nærøyfjord is listed on UNESCO’s World Heritage List. A destination for cruise ships since the late 19th century, Flaam is the fourth most popular port of call in Norway. The town is within easy reach by car, bus or train from the port area. The Flåmsbana is a fascinating experience. 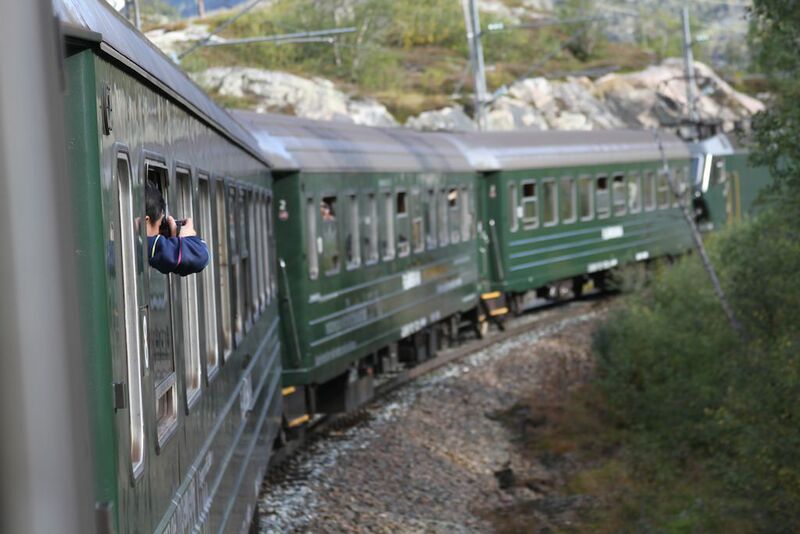 The Flåmsbana (Flåm Railway) is without a doubt the most well known attraction in Flaam. This spectacular railway connects Flaam with the town of Myrdal, 12.5 miles/20.2 kilometers away. What makes the railway so stunning is largely the combination of the height difference of 2,833 feet/863.5 meters, and the views that can be experienced along the way. Each year, some 585,000 travelers experience the Flåmsbana’s 20 tunnels. One of the world’s steepest railway lines on normal gauge, the building of the railway was a major challenge for the constructors. On average, it took a month to complete 3.3 feet/one meter of tunnel. The Otternes Farmyard. A center for traditional Norwegian cuisine and handicraft techniques, Otternes consists of 27 houses that have been preserved from the 1600s. Visitors are able to see traditional activities such as spinning, weaving, coloring of thread, baking and brewing. The view of the fjord from here is spectacular. The Undredal Stave Church, Norway's smallest church. The Flaam church, dating back to the Middle Ages. The church is mentioned in writing as early as 1320, but the church in its current form was built in 1667. 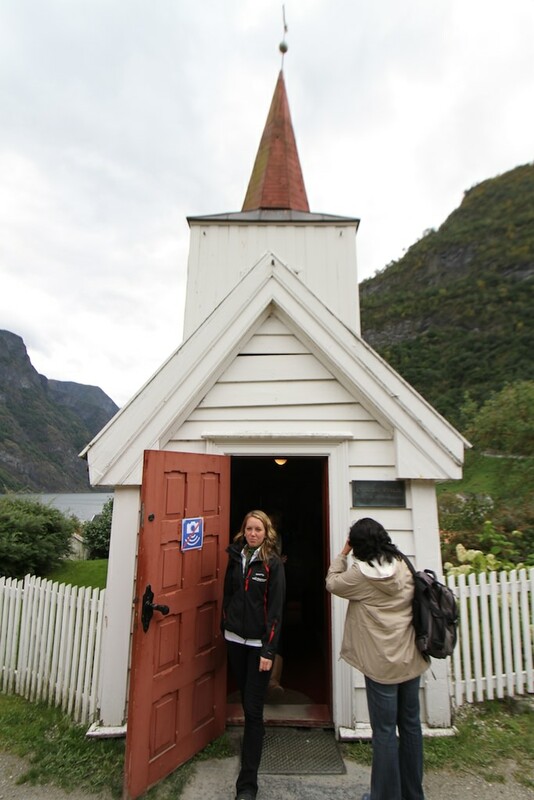 The Vangen church in Aurland (7.5 miles/12 kilometers from Flaam) is even older, built in 1202. And, speaking of churches, the nearby Undredal Stave Church (9 miles/14.5 kilometers from Flåm) is the smallest church in Scandinavia to still be in use. There are seats for 40 visitors. The Magical White Caves at Gudvangen. The white color of the walls of this cave labyrinth is a result of the Anorthosite rock in the region. Distance from Flaam: 17 miles/27 kilometers. For a quick lesson in how life is lived in this part of the world, you might want to visit Flaam Panorama. A film called “Living with the fjord” is shown daily. Nature. Wherever you go in this part of Norway, you will be close to the a scenery that is best described using superlatives. If you’re up to it, ask the locals (or the Tourist Information Office) where to go, bring a camera and experience nature at its best. 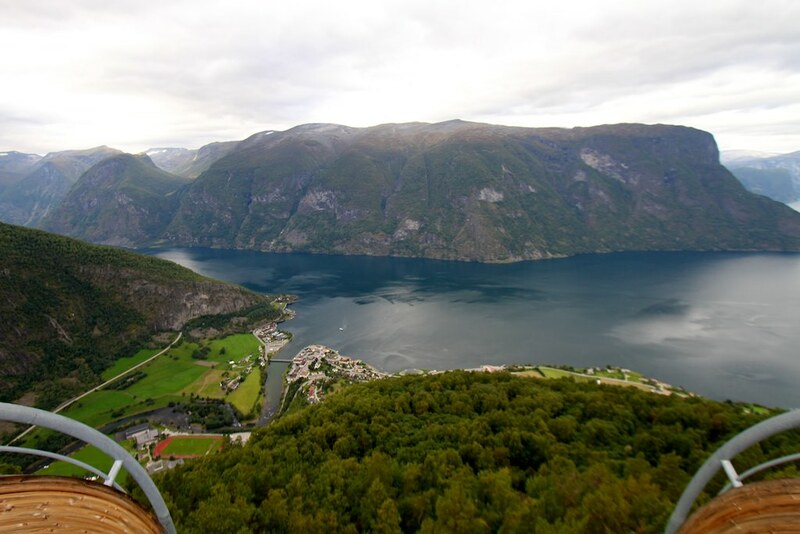 The view from Stegastein, a platform that extends 30 meters out and 640 meters above Aurlandsfjord. 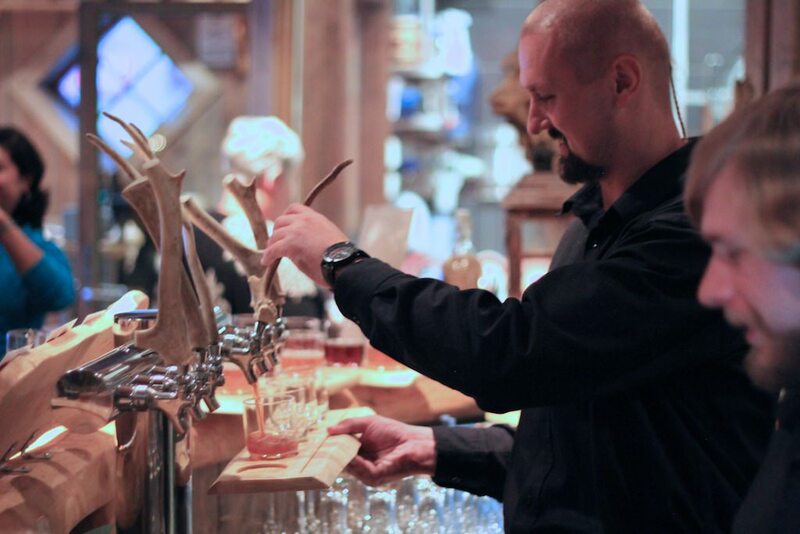 The Aegir Brewery, where Norse and local tradition meet in a modern incarnation of a Viking-inspired brewery, opened in 2007. The Aegir Brewery. Go beyond simple lagers and what was once the standard the Norwegian selection of beers: large or small. You will find The Flåm Railway Museum & Documentation Center in an old station building, some 330 feet/100 meters from the Flåm Railway. Entrance is free of charge. 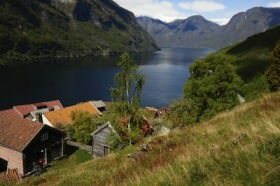 Accessible only by local ferry, The Styvi Farm Museum on the east side of the Nærøyfjord is a place where people have lived since the Viking Age. A large number of agricultural artifacts are on display. The distance from Flåm is 19 miles/31 kilometers. The Wild Salmon Center can be found on the banks of the Lærdal River. The center aims to educate about various aspects of salmon and salmon fishing. The distance from Flåm is some 28 miles, or 44.5 kilometers. Coach tours of the surrounding area are available, some of which will include, for example, Lærdal and the Wild Salmon Center mentioned above. Others will take you to Gudvangen and a close encounter with the Nærøyfjord and the many waterfalls that are to be found there. It’s possible to travel in one direction by motorcoach and return by boat through Nærøyfjord. 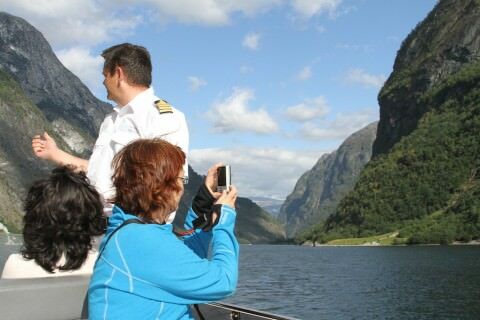 The Nærøyfjord can also be experienced on a tour by local boat, starting in the Aurlandsfjord (where Flaam is situated) and continuing into the narrow and dramatic fjord arm known as the Nærøyfjord. Kayaking on the Aurlandsfjord is an excellent way to get close to the Norwegian nature. Train & Bike, take the Flåmsbana (Flåm Railway) one way and cycle back. Click to view an Avid Cruiser Feature Video. 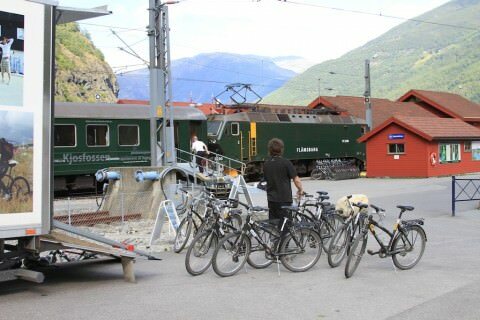 Train & Bike, take the Flåmsbana (Flåm Railway) one way and cycle back. Bergen is the closest city, some 105 miles (168 kilometers) away. Norway’s capital, Oslo, is 207 miles (334 kilometers) away. Avid Cruiser Posts, Photographs and Videos Featuring Flåm.